UNA alumnus Marty Abroms is the President and Managing Shareholder of Abroms & Associates, P.C. Abroms & Associates, which provides accounting, tax and consulting services for clients with operations throughout the United States, Europe, Asia and Latin America. Mr. Abroms also serves as a certified valuation analyst, providing key valuations on mergers and acquisitions, estate and gift tax matters and the like. Mr. Abroms’ impressive resume includes the oversight of over 200 acquisitions and divestitures, positions on several Board of Directors for companies in which he holds investments, premiere client accounts such as the Anderson Companies, and a seat on the University of North Alabama Board of Trustees. He works with a number of nonprofit charities and religious organizations as well. Upon graduation from UNA in 1981, Mr. Abroms was the recipient of the Turis Fidelas Award, given for holding the highest university grade point average; the Keller Key Award for top university service; and the Elijah Watt Sells Award, presented to the few candidates who passed each section of the CPA exam on the first attempt and earned the highest marks in the country. What organizations were you involved with at UNA? Student Activities Board President, ATO fraternity, SOAR Program Counselor and moved up to Assistant Director the next year. Who were your mentors while attending UNA? John C. (“Jack”) Martin ran the Student Activities Board and was a great mentor and friend. Aaron Lynch, CPA and Lorraine Glasscock who served on the Accounting Faculty, Barry Morris on the Economics Faculty, Bud Smith from Marketing, Robert Allen Holder from Speech, and others whom are too numerous to mention and remember! How were those mentors expressly inspiring or integral in shaping you as a person and as a professional? Jack Martin showed me the importance of being a good people person and the importance of really listening to what one is saying to you. Aaron Lynch gave me the only “D” grade I had ever had in my life on a pop quiz when I was a freshman. Although I did not realize it until later years, that was how he sent a message that “you are not in high school anymore” and you better step up your game if you are going to excel in accounting at the college level. I did make an A in his class---after I quit goofing off, of course. Lorraine Glasscock was the sharpest dressed lady I had ever seen –and was willing to spend extra time with us to be sure “we got it.” So, I try to give others my time to help be sure they “get it” before I move on to the next subject. Barry Morris introduced me to economics and corporate finance and taught me “it is OK to question conventional wisdom.” He is still doing that on the SEDA Board and the Florence City Council. Robert Allen Holder might have been one of the most unconventional professors I had. Back in those days there was a bit less restrictions on fraternization with students and Robert Allen would attend parties with us. He was funny and a jokester and a bit on the edge. But, in the classroom, he would challenge us to “perform” and not cut corners. So, I guess you could say that he taught me that it is possible to play hard--- but best to also work hard. And there is a place for both in college life and in one’s professional world. 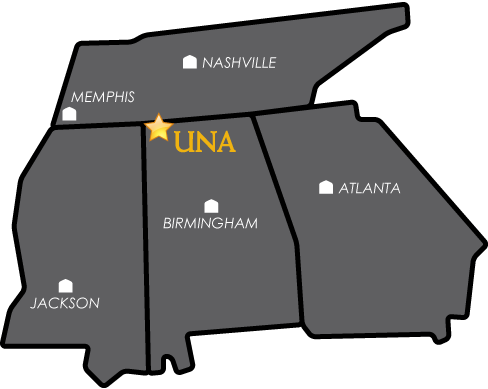 How has your UNA experience contributed to the success of your firm? The knowledge-base and technical training were very strong and allowed me to succeed in my profession. However, the social interactions I had were equally important---it’s all about people and relationships! Do you have any additional thoughts you'd like to share about your experience at UNA or your current involvement with the school? I loved my experience at UNA. Because of my current involvement as a Trustee, I continue to stay very involved with UNA events, although quite a different perspective I had as a student. But my student experience helps me to stay “student focused” on all of the hard decisions we have to make as Trustees. Why would you recommend UNA’s College of Business to those seeking to earn a business degree or MBA? I know the culture has not changed since I graduated. If one gets a UNA degree and puts in the extra time, they can compete with any Ivy League school graduate in the world of business. We have many very successful examples. Join the College of Business Alumni site to connect with other alumni.